Stephen Curry measures approximately 8 1/2-inches tall. Figure features a museum-quality head sculpt and an authentic likeness. Boasts 34 points of articulation, 8 interchangeable hands, a 1:9 scale Spalding basketball, and more! 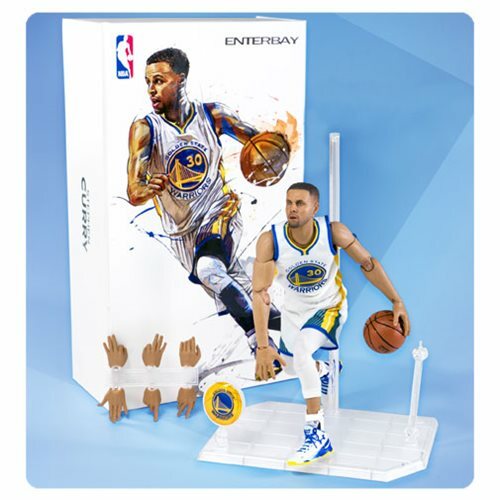 This NBA Collection Stephen Curry Motion Masterpiece 1:9 Scale Action Figure is a must-have for any fan of the Baby-Faced Assassin. With a museum-quality head sculpt and authentic likeness achieved through a multilayer paint application, Curry boasts 34 points of articulation that allow for ease of motion. Pose him any way you want! He comes with 8 signature interchangeable hands, a 1:9 scale Spalding basketball, and a specially designed action figure stand that allows the plastic figure to be easily connected by a magnet. Curry is decked out in his Golden State Warriors official home uniform, basketball tights, a pair of ankle supports, a pair of official Stance NBA socks, and a pair of Curry player edition sneakers (Under Armour Curry 2). There's a Golden State Warriors team logo moveable plate for the action figure stand. Measures approximately 8 1/2-inches tall. Ages 15 and up.